Update: This is the first part of my discussion on the topic. For part 2 go here; for part 3 here. 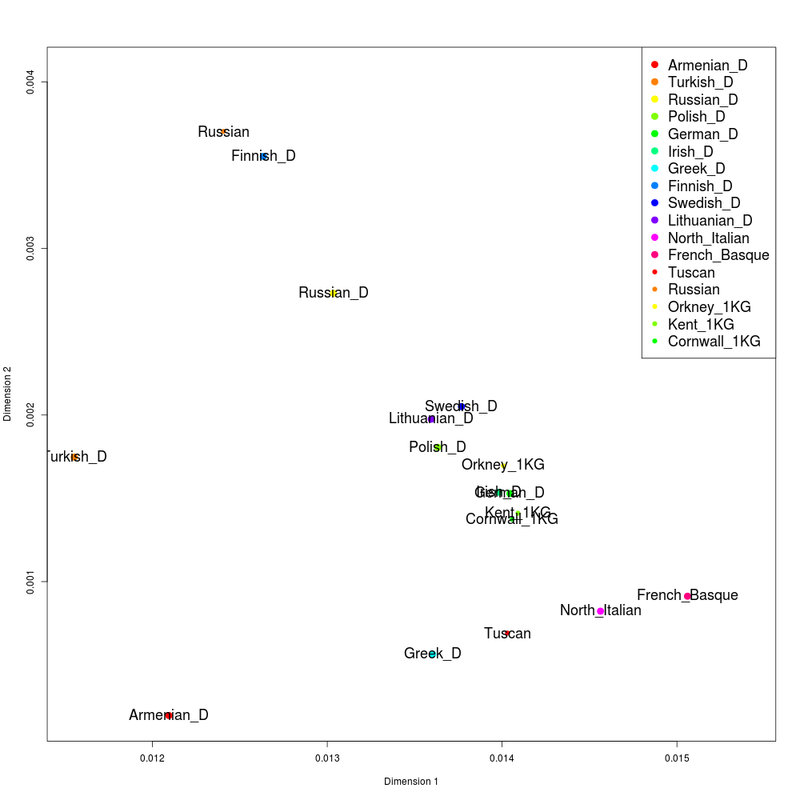 ... east/central Asian admixture has affected northern Europeans to a greater extent than Sardinians (in our separate manuscript in submission, we show that this is a result of the different amounts of central/east Asian-related gene flow into these groups). I used the implementation of the 4-population test of Reich et al. (2009) in the fourpop program of TreeMix. 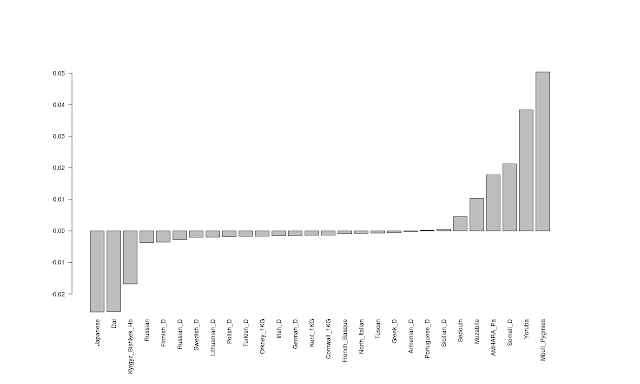 255,020 SNPs common in the various datasets were used throughout, and blocks of 200 SNPs for standard error estimation. 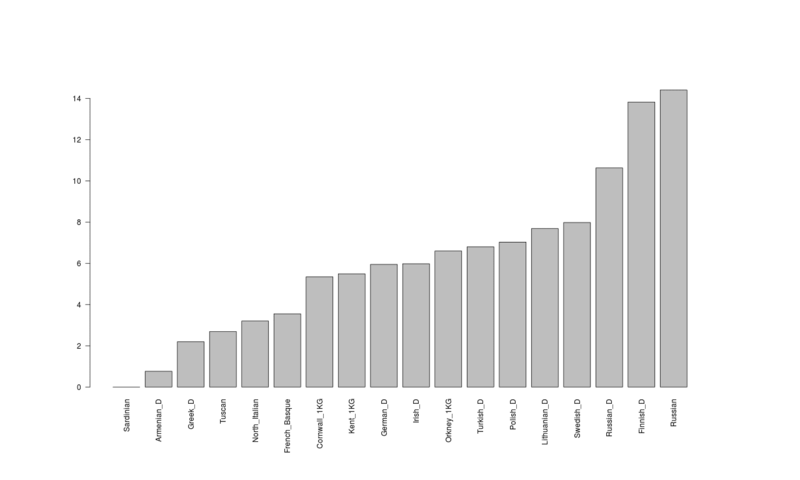 As always, you can find a list of population sources at the bottom of the Dodecad blog. As I have noted in my review of Moorjani et al., this test shows a superposition of a set of populations on the African-East Asian axis, so populations occupy different positions depending on whether they have African or East Asian admixture. It's a palimpsest. That paper ignored the Eastern ancestry in North Europeans, and used the CEU (a population of mainly North European origin) instead of Sardinians, hence generating inflated estimates of African ancestry in Southern Europeans. Now that the Central/East Asian ancestry in northern Europeans seems to be recognized by some of the co-authors of the earlier paper, and using the Reich et al. (2012) framework, the different processes superimposed on the African-East Asian axis can probably be disentangled. Hopefully, we won't have to wait too long for the full treatment. Maybe it can go to the arXiv too! It is quite clear that North European populations are shifted towards East Asians, with the exception of the Turkish_D sample which is also so shifted, due to its Central Asian Turkic admixture. There are also a few cases of substantial African shift, such as the Bedouin and Mozabite Berbers. I have calculated the correlation coefficient between the f4 statistics for this set of West_Eurasian populations and the sum of the Siberian+East Asian components of my K7b calculator on the same set of populations. This is +0.85, highly significant, and consistent with the idea that ADMIXTURE software and formal tests of admixture capture the same phenomenon. I also calculated the correlation coefficient with the Atlantic_Baltic component that is modal in Europeans, which is equal to +0.56 and confirms the higher East Eurasian shift in European populations. The regression analysis shows a weak correlation (R^2=0.149). The southern Caucasoid populations from Armenia to Iberia appear roughly perpendicular to the north European cline, suggesting that they do not significantly partake in the same phenomenon as the northern groups. 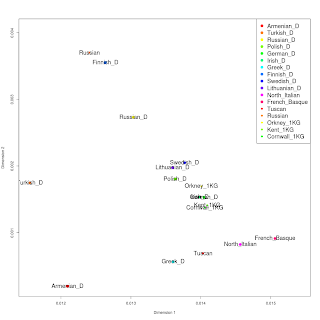 Now, North_Italian shows no East-Eurasian-like admixture relative to French Basque, so there is one less row. 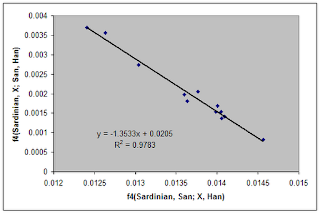 The Basques appear to be Asian-shifted relative to Sardinians, so, overall, I would trust the former results more than the latter, but, in any case, the overall pattern seems fairly solid across a choice of reference populations. ... as well as the remark in passim in the Reich et al. (2012) supplementary material mentioned above. The prominent position that Sardinians have assumed in the genetic history of Europe puts the discovery of Veeramah et al. that Sardinians tend to be monomorphic in sites where mainland Europeans are polymorphic into new light. It now appears that the reduced genetic polymorphism of Sardinians vis a vis mainland Europeans may not be due to them having undergone a "bottleneck" relative to mainland Europeans, but rather, at least in part, a consequence of admixture in the latter. Admixture matters. Hopefully, geneticists will become more willing to interpret patterns of decrasing genetic diversity not only as a consequence of diversity-reducing "bottlenecks", but also of admixture in populations that are especially diverse. In the case of Sardinians and Europeans we have been lucky in that East Asians continue to exist, helping us untangle their (or their relatives') contribution to the population history of Europe. But, in other cases (such as the introgression of archaic DNA into the modern human gene pool), latent population admixture between divergent populations may lead to misinterpretations of the direction of gene flow. The raw dump of fourpop output can be obtained from here (for Sardinian-Han-San) and here (for Basque-Mbuti-Dai). Have you also considered the reverse idea, the possibility of Northern European admixture in Siberian East Eurasians? I ask this because I know that the presence of X haplogroup mtDNA amongst some groups of Native Americans has caused some to wonder about the prospects of Europeans crossing the Atlantic in prehistoric times, including Brian Sykes in his latest book "DNA USA". It seems much more likely to me that North European and Siberian hunters met and mixed to a small extent in the boreal forest zone which they shared with some dispersal of genes to either end of the zone. Have you also considered the reverse idea, the possibility of Northern European admixture in Siberian East Eurasians? No, because the pattern is the same with the Dai people of S China. Nice work. I don't think you nailed it though. We'll have to wait for that study to see what the real story is, both with the percentages and age of East Eurasian admixture. I see no reason why it should be recent, if non-Arctic Amerindians are closer to West Eurasians because of it (vs. Chukchi and Koryak even!). If it was recent, then we'd see Arctic Amerindians and Siberians being closer. Also, I still think the Sub-Saharan f4 percentages from that last study were fine. You’re just ideologically opposed to the outcome. Time to get over it. You don't understand math. Time to learn. Also the f4 statistics are not "percentages"
So what's your theory why Southern Amerindians are closer to West Eurasians than Arctic populations because of this admixture? There had to be two migrations from the same source in East Asia about 15,000 years ago - one going to Europe, and another to the Americas. The only other option is that the proto-South Amerindian ancestry was somehow preserved in Central Asia, and then came to Europe about 10,000 years later than crossing the Bering Strait. Doesn't sound plausible. "Have you also considered the reverse idea, the possibility of Northern European admixture in Siberian East Eurasians?" "No, because the pattern is the same with the Dai people of S China." But I recall that this tree-builder software, you once tried, suggested something like that. 1. Northern Euro branches off the other Caucasian elements. 2. Other Caucasian Elements (except North Euro) recieve fresh East_African DNA. (is this actually the reason for Caucasians who are out of reach to recieve that infusion to "branch off"? 4. Southern Asian branches off the Caucasian craddle. 5. Remaining Caucasians recieve more fresh East African DNA. (Again? Does the extra East African infusion seperate the craddle from South Asia? 8. Mediteranean branches away from South-West Asian. 10. Northern Euro recieves DNA from Mediteranean. That tree building thing actually suggested a very early contact of Northern Euro with NE Asian. But it suggested N.Euro TOWARDS NE Asian as the direction of Geneflow. Well, in any case, it suggests a very early contact, no matter the direction. That Spanish HG pull stronger towards East Asia than modern Fin and Russians do, is another hint of an very early contact. So what? There's plenty of archaeological and physical anthropological evidence for pre-LGM West/Central Eurasian influence on East Eurasians. Deeper genetic analyses give indications of the same. This is likely the predominant driver of any increased affinity between Northern Europeans and Amerindians / E. Asians. Also, zero African in Portuguese does not say much for the calibration of your admixture estimates. "It seems much more likely to me that North European and Siberian hunters met and mixed to a small extent in the boreal forest zone which they shared with some dispersal of genes to either end of the zone". That is likely to be so. But the Siberians of that time did not contain the full complement of East Asia. For example Amerindians do not have the most common East Asian haplogroups (N and O), most easily explained as these haplogroups having moved north some time after the Central Asians had arrived in America. "the presence of X haplogroup mtDNA amongst some groups of Native Americans has caused some to wonder about the prospects of Europeans crossing the Atlantic in prehistoric times"
To my way of thinking X was one of the early mt-DNA haplogroups to accompany Y-DNA Q out of Central Asia. Along the way that particular haplogroup became diluted through the addition of East Asian mt-DNA haplogroups. "So what's your theory why Southern Amerindians are closer to West Eurasians than Arctic populations because of this admixture?". This is my theory. Dienekes can speak for himself. The connection is not with West Eurasians but with early Central Asians. Those Southern Amerindians have been cut off from their Central Asian origins by the expansion of that same East Asian element that reached Northern Europe. Which indicates that the Portuguese have a small San-shift relative to Sardinians. As a mainland European population, the Portuguse have a negative San-shift, but because of their African admixture, a positive one. In the palimpsest of influences, the two add together to 0.000201745 (Z=1.54692). So, these results ARE consistent with the presence of African ancestry in the Portuguese. The first (Sardinian related) set of estimates seem wildly incongruent with physical anthropology. Near 20% Mongoloid admixture in Finns and Russians? 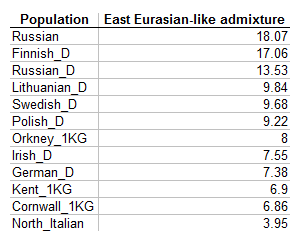 Unless there were an incredible deselection of Asiatic traits in these populations over the generations, or this admixture predates the evolution of West Eurasian features (which is unlikely given the Sardinians' lack of it), then we'd be better off with the first set's estimates and the usual ADMIXTURE findings of around 10% for Finns and Russians. Also, the levels between physically Mongoloid-absent groups, such as Kent and Cornwall, and physically Mongoloid-present groups, such as Poles, expressed one a proportion of the other, again seem extremely incongruent with any reasonable physical observation. It seems probable that Siberians and Native Americans have a hefty dose of West Eurasian. Even on simple ADMIXTURE tests, when only European, East Asian and African components are offered, a large chunk of Native American DNA prefers to associate with the European component. 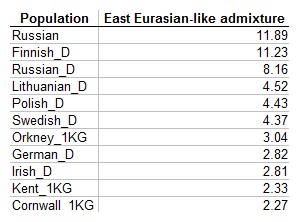 And as for Siberians/inner Asians, even the most physically extreme Mongoloids have a considerable W. Eurasian component, as can be seen on any Dodecad spreadsheet. What's up with the Irish? Why do they have more East Eurasian admixture than other continental Europeans? Also, according to the first f4 values, Southern Europeans have considerably less sub-Saharan admixture than Northern Europeans have with East Asian admixture. Is it because you used the San as the representative of sub-Saharan Africa? "The connection is not with West Eurasians but with early Central Asians. Those Southern Amerindians have been cut off from their Central Asian origins by the expansion of that same East Asian element that reached Northern Europe"
Looks like that. And those Chukchis and Koryaks are recent arrivals than Amerindian exodus from Asia.
" And those Chukchis and Koryaks are recent arrivals than Amerindian exodus from Asia".